I’m super-stoked to see the prevalence of Twitter amongst the different regions of the United Methodist Church. I’m not super-stoked to see short-sighted social media policies by those different regions. The short-sighted policy? Annual conferences are increasingly using dates in their hashtags. For example, let’s look at Twitter-savvy Ken Carter’s annual conference of Florida. In 2010, Florida AC used #flumc as the hashtag. It makes sense: @flumc is their twitter account, flumc2.org is their website. And yet in 2012 and 2013, they used #flc12 and the ridiculously long #flac2013. This phenomenon has grown since 2009, as the bullet points below indicate. I’m using Andrew Conard’s list of annual conferences from 2009, 2010, and 2012, and UMC.org for 2013. The first objection is easy. Yes, it uses less letters. Done. Using the year means that once the event is done, the hashtag loses its value. Will a twitter user post something next week about #OKUMC using #ac2013? No. They will use #OKUMC. And that means that only people who have previously used that hashtag will see it. If an entire week’s worth of new twitterers and delegated used the event-specific hashtag, they won’t see new content. Using the year means that communicators don’t have a built-in channel for content. If everyone used the same hashtag, then more people would likely save the search or have it in mind when they tweet about their own annual conference. Using event-specific ones rob the people of that channel (ie. #UMC refers to ongoing UMC stuff, not just a week or a day’s worth). Finally, it’s not United Methodist to refer to Annual Conference as an event and not a perpetuity. We are all in Annual Conferences, which are annual events, yes, but they are also organizing bodies for a region. The Annual Conference does not exist for only 3-5 days, it exists for 365/366 days a year. So using a channel that implies interesting work only happens once a year is not Methodist and undercuts the perpetual work of the region. My hope is that more conference revert to using perpetual hashtags so that the work of the annual conference is noticed and made known throughout the year not just one week. It just makes good social media and Methodist sense. One of the things I love best about this blog is Jeremy’s combination of majors issues and pedestrian (seemingly irrelevant). This kind of strategic communications commentary is helpful for many of us who are using experience to discover those details which distinguish between excellent and mediocre campaigns. I had the same concern but hadn’t articulated the reasons I didn’t like it. You did that much better than I could have. Thanks. And effectively telling the story IS the really important thing. That statement carries with it a very large assumption. Out of all of the above, this is what you bring up? I don’t think it is a big assumption. Twitter only keeps searches for a short amount of time, I think 36 months in some cases, less if no one uses the hashtag at all. So all the tweeting and comments will be lost to everyone except the advertisers after that period. Searching for content on #okumc brings in content year-round. Searching for content on #ac2013 brings in this year and only for one week. That’s it. Which one shows a more robust Methodism in Oklahoma? 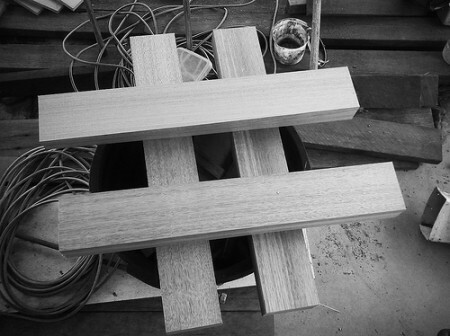 The assumption is that either hashtags or Twitter have value. If I concede for the sake of argument that they do, then your suggestion is on target and I don’t disagree with it. It’s the same thing as Facebook groups from a camp or an event for one year, or a band’s concert tour, or a political campaign for a particular election. Or even a book that focuses on a public figure or group or subject of the moment. My disagreement is with the idea that Twitter and hashtags indicate much beyond temporary interest. It wouldn’t be great … It would be madness. So we’re seeking out a more generic tag for church ministries, outside of our big event trips. Just makes more sense. Like you said, if we had a generic tag everybody used for our congregation, you get a better idea of all of the awesome things that are happening.